I admit it, I’m a bit of a girly girl. I love playing with makeup, painting my toenails and making my hair pretty. Thing is, that can be tough to do leaning over a bathroom counter, peering into a too far away mirror in bad lighting! And our daughter Rachel is even more of a girly girl, and wanted a light up vanity mirror for her new bedroom. 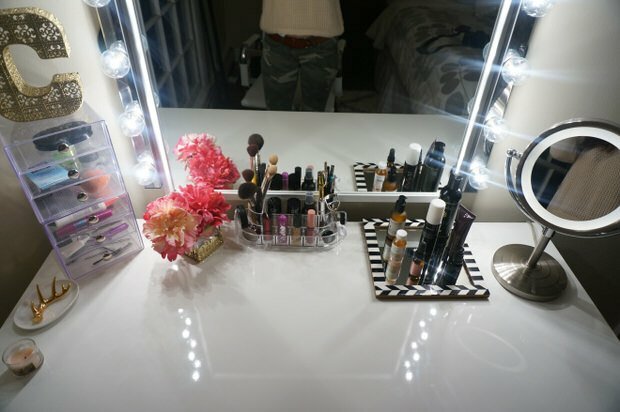 Let’s face it, what girl wouldn’t want a light up vanity mirror? Even if you are a natural girl, it feels good to pamper yourself, right? So we decided to go glam, and find some DIY vanity and makeup mirrors with lights to share! First we have an easy Hollywood vanity mirror with lights from ‘Lisa Pullano‘. This DIY video tutorial walks you through creating this glam mirror. All they used was a couple of inexpensive vanity lights and an extension cord. Jessica from ‘BeautyFit‘ made this DIY vanity mirror with lights from IKEA. I really like how she wrapped the lights over the top of the mirror as well, as lighting is key when it comes to beauty! Easy instructions with lots of photos. Cindy at ‘Made 2 Style‘ made this entire DIY light up makeup mirror vanity from Ikea pieces, and she did the whole thing for under $80! A store bought set up like this could easily cost hundreds, so definitely worth the DIY. Want a full length dressing mirror? 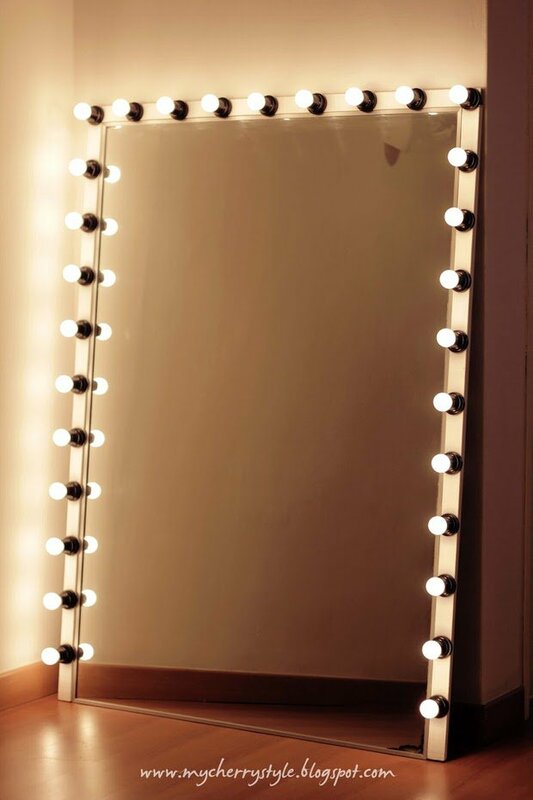 This DIY Hollywood mirror with lights is just that! From ‘My Cherry Style‘, this is a detailed tutorial that will take your closet or dressing area to glam, fast. We found this vanity idea on ‘Musely‘. It doesn’t have a tutorial, but it’s something that could be DIY’ed. Try using some string lights (the ones with the little globes) or some rope lighting. It looks like they just ran the light end down the wall in the middle bottom of the mirror, and placed a piece of art over it to camouflage. The secret here is the ornate mirror frame… that gives it the old time glam feel. Finally, from Kristi at ‘Addicted 2 Decorating‘, we love this easy DIY lighted bathroom vanity mirror. Why? ‘Cause a lot of you don’t have the space to set up a separate vanity or dressing and makeup area, or may choose to work with your bathroom. Kristi found a way to give you that vanity lighting and make it look like great decor. Also, have it all done for a lot less because you DIY’ed it! So now that you know just how to DIY Light Up Vanity Mirrors, we think you will also love our posts on Tiny Bathroom Makeovers and DIY Makeup Storage Ideas! Trying to find instructions for Sofias mirror… Any links? Thank you for sharing this. I did the custom for my studio. All looks great !